I went shopping at Trader Joe’s this afternoon. Now, I realize that doesn’t sound especially momentous. This was, however, the first time I’d darkened the doorstep of a Trader Joe’s in a good eight years — since my corporate days, when I worked a mere two blocks from the local TJ’s and dropped in there frequently. My new life in self-employment keeping me chained to my desk at home most of the time, and with the home of the “Fearless Flyer” being now more than a little out of my way, TJ’s and I have drifted apart. A shiny new Trader Joe’s opened in Santa Rosa a while back, right around the corner from my favorite Hawaiian barbecue joint — which, as fate would have it, has been closed ever since some nutcase drove his car through the front of the restaurant. With the news of the recent death of Trader Joe’s reclusive German owner, Theo Albrecht, fresh in my mind, and with a few hours of free time on my hands, I decided to venture in and check out the goods. For the benefit of those of you unfortunate enough to live out of range of a Trader Joe’s, I’ll explain what I’m talking about. Trader Joe’s is a chain of specialty markets that’s big here in California. Originally a group of convenience stores, Trader Joe’s changed its image in the late 1960s, adopting a Polynesian motif and stocking select products sold mostly under its house brand names. (These often riff on the ethnicity of the comestibles in question — my chicken quesadillas, for example, bore the moniker “Trader Jose’s.”) Unlike a conventional supermarket, where you can buy practically anything your stomach desires, Trader Joe’s focuses on a narrow blend of gourmet and organic foods and household products. The store caters to a niche clientele including foodies, aging hippies, and bargain hunters. Eschewing big-budget advertising, Trader Joe’s mostly draws customers in via its “Fearless Flyer,” a multipage direct-mail circular printed on cheap paper and featuring cartoons in the style of Victorian-era illustration. The store’s merchandise profile changes constantly — you learn never to get hooked on a Trader Joe’s item, because they’ll stop selling it the moment you do — but often includes unique products (especially seafood and frozen entrees) you’d never find anywhere else. Because almost all of the product line is branded in-house, TJ’s “cuts out the middleman” and frequently offers surprisingly good value for such an upscale retailer. I strolled into the shiny new-ish TJ’s today with few expectations. I ended up needing a second handbasket to carry all of the stuff I lugged to the cash register, where a stone-faced college student in an aloha shirt (that’s part of the TJ’s vibe — all of the employees wear colorful Hawaiian shirts, and summon one another to the registers not with an intercom, but with a hand bell) totaled and bagged my purchases. I came away with frozen dinner items to feed myself for the next week, a few snacks, two cans of whole bean coffee, and a box of vanilla almond granola (quite tasty — I’m eating a bowl as I type). The store was brightly lit and cheery, if rather spartan in decor — another Trader Joe’s trademark — and everyone, both staff and shoppers, seemed happy to be there. (Everyone, that is, except my cashier, whose personality made the prosaic bag of raw almonds I bought seem lively by comparison.) I know I was. Comic Art Friday: Imperius Rex! I’m always tickled when a new addition to my Common Elements theme lands on my doorstep. The arrival of today’s featured artwork, however, represented a genuine coup for my signature gallery. Ramona Fradon, who created the above piece, was one of the first female artists — and one of the relative few, even to this day — to make her mark in the superhero comics genre. She broke into the business in the early 1950s, when the very idea of women working in mainstream comics was practically unheard of. Becoming the regular artist on Aquaman, Ms. Fradon garnered acclaim for her distinctive graceful style. In the 1960s, after an extended maternity leave, Ms. Fradon returned to comics as the co-creator (with writer Bob Haney) of Metamorpho, the Element Man. (That’s him on the right in today’s drawing.) During the following decade, she worked extensively for DC Comics (on such series as Plastic Man, Freedom Fighters, and the comic for which many know her best today, Super Friends), and on rare occasion for Marvel (most notably, Fantastic Four #133). Then, in 1980, she transitioned into newspaper comics, taking over the art chores on the long-running strip Brenda Starr when creator Dale Messick retired. Ms. Fradon drew the intrepid reporter’s adventures for the next 15 years. 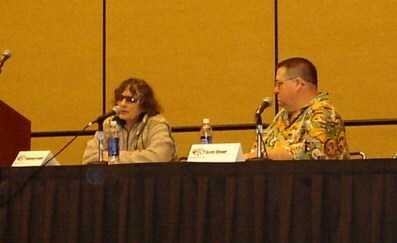 I had the honor of meeting Ms. Fradon four years ago at WonderCon, as she was about to be inducted into the Will Eisner Comic Book Hall of Fame. Here, she’s being interviewed by cartoonist Scott Shaw! (and yes, he spells it with an exclamation point). Ramona Fradon is mostly retired these days, but she’s still drawing for her fans, as the commission above attests. And as one can clearly see, her skills remain as sharp as ever, even though the artist is now well into her 80s. Accompanying Metamorpho is another hero named Rex — specifically, Rex “Tick-Tock” Tyler, the original Hourman. As was the case with many superheroes of comics’ Golden Age, Tyler acquired his power from ingesting chemicals; in his case, the vitamin compound Miraclo. A dose of Miraclo gave Tyler superhuman strength and endurance, but only for the 60 minutes the effect lasted — hence the name Hourman. (Frankly, I always thought advertising one’s weakness to the world would be the most foolish move a superhero could make — sort of like Superman calling himself Captain Allergic-to-Kryptonite. If I were a supervillain, I’d figure out a way to keep Hourman confined or occupied for 61 minutes, then I’d beat the stuffing out of him.) Interestingly, as the years progressed, Tyler actually became addicted to Miraclo — one of the first examples of comics dealing with such a powerful health and social issue. Speaking of time, I’m out of it for now. So that, friend reader, is your Comic Art Friday. 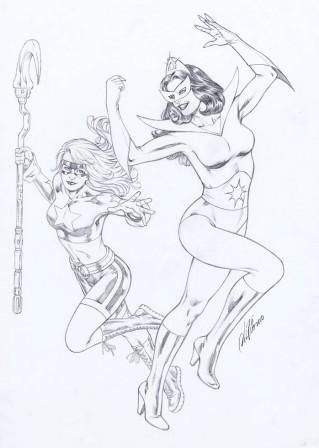 Today’s Comic Art Friday is dedicated to the Inkwell Awards, the annual honors issued to inkers, those unsung heroes and heroines of the comic art world who transform (often rough) pencil drawings into clear, completely finished art suitable for publication. The Inkwell Awards are the brainchild of my friend Bob Almond, an enormously talented inker perhaps best known for his lengthy stint on Marvel’s Black Panther, in collaboration with penciler Sal Velluto and writer Christopher Priest. In addition to his always exceptional artistic efforts, Bob is a tireless advocate for practitioners of his chosen craft, spending a great deal of his time and personal resources educating comics fans about the underappreciated, often misconstrued work of inking artists. Over the years that I’ve been collecting and commissioning original comic art, I’ve learned a wealth of inking lore from Bob. And, thanks to the numerous commissioned projects he’s done for me (more than 40 at last count), my galleries sparkle with his expertly applied inks. Given the fact that Bob and the rest of the Inkwell Awards team are currently soliciting votes for this year’s honors — an election in which you, friend reader, are cordially invited to participate — I thought this might be an excellent occasion to leap into the Wayback Machine and revisit the very first commission Bob ever inked for me. Here’s the original pencil art, as Bob received it. If you stopped by here last week, you’ll recognize the distinctive style of Al Rio. Bob Almond took this sketch and embellished it to a high gloss. He refined the figures, solidified the background elements, and added numerous details that are only hinted at — or in many instances absent altogether — in Al Rio’s pencil rough. When Bob’s work on the piece is complete, it’s no longer just a drawing. It has become a living, breathing example of finished comic art. Anyone with a discerning eye can see that the inker’s contribution to the completed work extends far beyond merely tracing the penciler’s lines, as many uneducated comics fans suppose. The inker’s additions are indispensable to the art as the reader expects to experience it. If you follow this link, you can read Mr. Almond’s own commentary about this commission, including Bob’s detailed description of the techniques and tools he employed. Every day in the world of comic books, talented men and women practice the fine art of inking. Their toils often go unheralded, especially by comparison with those of their penciling colleagues. Still, for every Jack Kirby who has become a household name through the power of his pencil, there is a Joe Sinnott, a Frank Giacoia, or a Mike Royer inking away in the background, making those pencils look fantastic. If you’re a comic art aficionado who values the abilities of inkers both historic and contemporary, please take a moment to surf over to the Inkwell Awards website and vote for your favorites. You’ll be glad you did. Today would have been KJ’s half-birthday. The custom of half-birthdays — and ultimately, half-anniversaries — was one that I brought into our relationship from my childhood. Because my birthday is only six days before Christmas, my major gift-receiving opportunities were bunched together into a single week of the calendar year. It became my habit, therefore, to observe my own half-birthday — the date exactly six months from my actual birthday — by doing a little something nice for myself on that day. When KJ and I became a couple, we continued to acknowledge half-holidays. We never really exchanged gifts on those days, but we always made note of the date with a card or something. Today seemed like a good day for roses. This being a special occasion, the roses are real. A chain grocery store near the cemetery sells a dozen pink roses quite inexpensively — I’ve purchased them there a couple of times previously. My plan is to find a set of silk ones that can remain on the crypt at all times without maintenance, except for occasions like this when I’ll swap the artificial ones for fresh. In case you’re wondering, KJ’s crypt is unmarked in this photo only because her marker hasn’t yet arrived. It should be ready for installation in about a month. The mausoleum requires that all of the markers follow an identical pattern, so they acquire them from the same source. KJ’s will consist of her name, birth year, and death year stamped from steel in a sleek sans-serif font. And yes… it still feels a little bit peculiar to be writing about this. 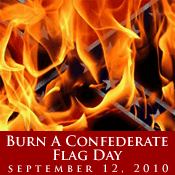 Burn a Confederate Flag Day, however, sounds like a celebration I could get behind. After all, racist whackos have been burning things — like, say, crosses — for decades. Turnabout is fair play. I’m not suggesting that anyone should go so far as to burn racist whackos. That would be taking things a little far. Then again, if you wanted to throw a photo of your favorite racist whacko (there are so many to choose from these days — Limbaugh? Beck? Dr. Laura? Mad Mel Gibson? — you many need multiples) on the pyre as you’re toasting your rebel banner on September 12, that would be all right with me. Just be sure to clean up the mess afterward. Don’t forget, Talk Like a Pirate Day is only a week later. You don’t want random ashes lying around on the big day.